or if you have it has been a while. So, once you arrive at the testing facility you will wait to enter the reception area with about 20 other nervous electricians. When they open the door you will be instructed to sit until your name is called. When you get called give the person your ID, sign in, and get your License photo taken. Then you will receive your code book or let them check yours. They will show you a locker in which you put everything that isn't allowed in the testing area ie. backpack, wallet, phone, smokes, lighters etc. (Nothing is allowed in the testing area). Then you go directly into the testing area where she will explain how to use the computer and start you on the tutorial. I made my tests with the look and feel of the real thing so if you want to see a good example of computer based electrical exams just go to the Practice Exam folder and take it. You should be clear on what reference materials will be allowed in the testing room. In some states you can use your personal, code book, only if there is no writing in the side-bar, but highlighting the content is OK. There is a list of allowable items in the handbook provided by Pearson VUE. Some states do not allow the use of your personal, NEC code book but provide one for you ( with or without tabs ). Colorado did not allow an Ugly's book but New Hampshire did. If you didn't get a handbook just call the testing facility to see what they will allow. Click Here to see a video of the example test at a ProV testing Center. This doesn't play on your phone. You will be sitting at a cubicle with a computer screen a keyboard and a mouse. 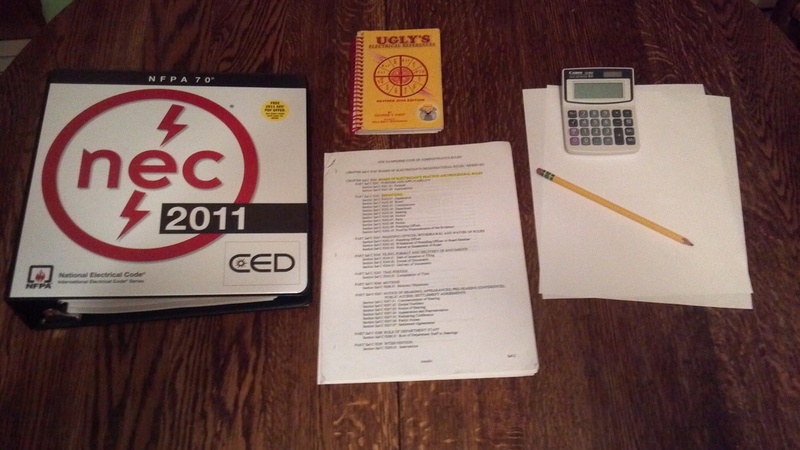 You will have your, NEC book or one provided to you by the testing facility. Also an Ugly's book ( if they allow it ), calculator, pencil and one piece of scrap paper that will be provided to you. In some states you will be tested on administration rules and state amendments to electrical code. If this is the case you MUST print a copy of these amendments from your State Electrical Board web site and bring them with you. I hope this information was valuable to you. Pay it forward and message me about what articles you saw and what exam you took. I am happy to answer any questions about testing facilities. Just write me a message.